Watch Out! Here Come E-Scooters! As we know from Uber, Lift, and other services — vehicle sharing is now a part of our lives. 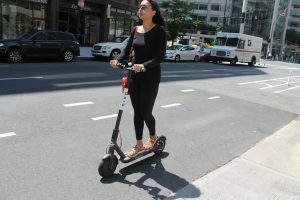 In fact, in larger cities, you may have noticed vehicle sharing includes “E-Scooters”. E-Scooters are pay-per-minute electric scooters. Estimates demonstrate that since 2010, the bike-share industry has offered users more than 123,000,000 paid trips in the United States. And E-Scooters are prepared to meet or exceed that amount of traffic. So what do you look for in a safe E-Scooter? Consider proper maintenance of the E-Scooter and all necessary equipment. The providers should be responsible for maintenance of their vehicles. These vehicles are customarily in heavy use. There should be safety inspections to identify maintenance problems such as worn brakes, damaged tires, etc. Sharing services are responsible for reasonably inspecting and reasonably maintaining their vehicles, including E-Scooters. Find out whether the service offers or provides helmets or other head protection. Some companies offer free or discounted helmets, or have on-site helmet dispensers. Given the dangers associated with these modes of transportation, a strong argument exists that helmets should be mandatory. And in the face of a serious injury, an investigation should be started promptly to immediately preserve any video footage where the incident took place, and the vehicle involved in the injury. Preservation letters must be sent to the E-Scooter sharing service demanding that the subject vehicle be taken out of service immediately and preserved for inspection. Once the evidence is preserved, qualified experts can evaluate that evidence. As Spring approaches, E-Scooters are coming our way. We need to be mindful of the risks presented and the best safety procedures.